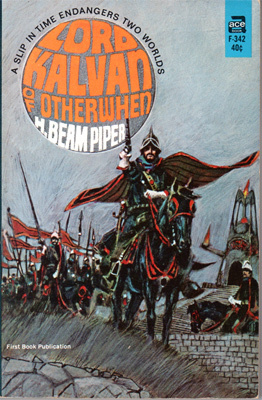 Lord Kalvan of Otherwhen is the last novel written by H. Beam Piper. 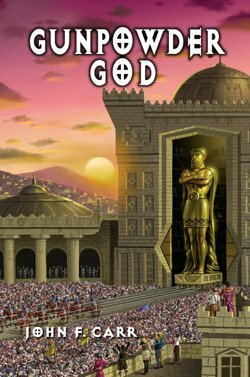 Originally published in 1965, it tells the story of Pennsylvania State Trooper Calvin Morrison, who finds himself accidentally transported to an alternate reality in what we know as North America, whose inhabitants are technologically on par with the 16th century of our own reality. Calvin Morrison allies himself with the small princedom of Hostigos, where he is named Lord Kalvan in the local Zarthani language. However, Kalvan quickly finds enemies in the tyrannical theocracy of Styphon's House, who until Kalvan's arrival had sole control of the secret of gunpowder. Kalvan is also being watched by the Paratime police, who wish to ensure that Kalvan does not discover the secret of Paratime transposition. John F. Carr controls the rights to writing sequels to this original novel in the style of H. Beam Piper. 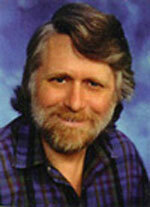 To date, Carr has published four complete sequels, with a fifth due to be released in early 2012. In addition to writing the Lord Kalvan sequels, Carr also belonged to an informal fan group, known as the Amateur Piper Association, which corresponded via a group mailing list, discussing Piper-related topics and writing short stories in the Piper spirit. For more information on the APA, click here. 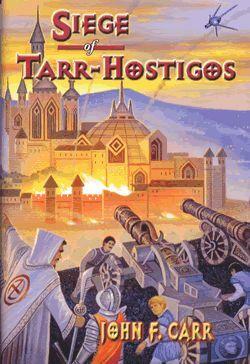 For more information on Lord Kalvan, Hostigos, and its history, visit Hostigos.com. Click here to view a virtual tour of the actual places mentioned in the novel Lord Kalvan of Otherwhen with photos, as well as a Lord Kalvan concordance. These files contain research or background material for stories or novels related to the Paratime Universe. The notes cover information on: Commercial regulations, trading firms, commercial resident agents, citizenship, military, fourth level societies, first level societies, Bureau of Psychological Hygiene, cities, religion, and key characters. There are written notes and check marks as well on many of the pages. The contents of a folder marked “APA Kalvans.” Its contents include correspondence from the members of the APA, an Amateur Press Association dedicated to H. Beam Piper. This informal fan group, whose members included Lee Brainard, Roland Green, Jim Landau, and John Carr, traded research and original science fiction stories with eachother by mail during the 1980s and 1990s. The contents of this folder include items sent to Carr by the other members of the group, including brochures, original typed stories, and news clippings of interest. The dates on these mailed materials range from 1985 to 1987. The papers bear some smoke damage from John Carr’s office fire. The contents of this folder have been broken into two separate folders labeled Carr-11-01-A and Carr-11-01-B, respectively. The contents of a folder marked “APA papers.” Its contents include further correspondence between the members of the Amateur Piper Association. The correspondences relate mainly to the Lord Kalvan storyline, and include greeting cards, articles, newsletters programs, newspaper clippings, maps, and photographs in addition to many letters. The materials are dated between 1987 and 1989. The materials bear smake and water damage from Carr’s office fire. The contents of this file have been separated into two separate files, labeled Carr-11-02-A and Carr-11-02-B, respectively. The contents of a file labeled “APA Kalvan.” These materials were presumably given to Carr by fellow APA member Jim Landau, as can be seen in the various cover letters dividing the material. Included in the material are letter from Carr and the other members of the Amateur Piper Association, dated between 1986 and 1988. The letters pertain mainly to the works of H. Beam Piper as well as the Lord Kalvan storyline. Also included amongst the letters are copies of excerpts of books and maps. The contents of this file bear smoke damage from Carr’s office fire. An original story taking place in the country of Lord Kalvan, Hos-Hostigos, written by fellow APA member Jim Landau. The story was sent to Carr presumably sometime in the early 1990s, but this is unclear due to the fact that there is no date on the document itself and the postage labeled has been damaged by smoke from Carr’s office fire. According to his annotated copy of the John F. Carr collection list (Carr-17-15), Jim Landau notes that this story was completed on 3/11/1997 and sent to Carr shortly thereafter. A pair of original stories taking place in Hos-Hostigos written by Jim Landau. These two stories, titled “Plasma Rifle” and “The Uniform makes the Man,” were sent to Carr by Landau on 21 May 1991. An original Kalvan-related short piece written by Jim Landau entitled “Money Causes Lung Cancer.” This piece was sent to Carr by Landau possibly in the late 1980s or early 1990s, but the document bears no date to confirm this. According to his annotated copy of the John F. Carr collection list (Carr-17-15), Landau notes that this story was completed on 1/8/1995 and sent to Carr shortly thereafter. An original Kalvan-related short piece written by Jim Landau entitled “addendum to Report by Professor Aranth S.” This piece was sent to Carr by Landau on 4 May 1996, and it is associated with “The World through Rifle Sights” (Carr-11-14). An original Kalvan-related short piece written by Jim Landau entitled “Battle of Lyr River.” This piece was written and sent to John Carr by Landau in 1996. An original piece by Jim Landau titled “Panther Cub.” This longer piece, set in Hos-Hostigos, was sent to Carr in sections between 1988 and 1989. The story has 19 parts, and in the correspondence attached Landau expresses his intention to write a sequel, which became “The World Through Rifle Sights” (Carr-11-14). Some sections bear editing marks by Carr, and the entire document bears smoke damage form Carr’s office fire. This document is split into two files, labeled Carr-11-13-A and Carr-11-13-B, respectively. An original piece by Jim Landau titled “The World through Rifle Sights.” This piece, sent to Carr in sections between 1993 and 1996, is the sequel to Landau’s “Panther Cub.” The document includes the initial outline, parts 1-10 of the story, as well as parts 12-15. There is a piece in between parts 10 and 12 that seems to be a clarifying letter, but may also serve as part 11. The entire document bears some smoke damage from Carr’s office fire. These documents are composed of letters written by Jim Landau for Carr. The letters contain Landau’s comments on Carr’s writing, as well as sketches of maps of Hos-Hostigos and Hos-Harphax. A typed document bearing the title “Characters on Kalvan’s Timeline.” The document contains descriptions of the characters and locations in Kalvan’s world, as well as a guide to common names in that world. A short story written by Carr entitled “Back from the Dead.” Based upon the references in the story, it takes place in Lord Kalvan’s world. The document bears editing marks in red and blue ink. The contents of a file folder labeled “Hostigos Con.” The file contains letters, programs, and promotional flyers for the Hostigos convention, which took place June 10-12, 1988, in State College, PA. The material bears fire damage from Carr’s office fire. A collection of miscellaneous correspondence dealing with the Kalvan novels. The material includes emails and letters between Carr and multiple authors over a wide range of dates. A typed document describing the geography of the paratime world in which H. Beam Piper’s Lord Kalvan lives. The document is accompanied by a series of maps of the eastern United States, which have been altered to reflect the boundaries of the nations in Kalvan’s world. The documents bear fire damage and brittle edges caused by Carr’s California office fire. A variety of typed letters and printed emails written to Carr by various individuals regarding the Lord Kalvan novels. The correspondence ranges in date from 2001 to 2011. A large typed document containing notes pertaining to Lord Kalvan and the Paratime Universe. The document includes notes about characters as well as technology used in the universe. A typed document titled “The Political Geography of Grefftscharr.” The document provides background information about Nythros, a city state, and Greffa, a kingdom, in the world of Lord Kalvan. A typed document listing the names of Kingdom States and geographical features of the Upper Kingdoms in Lord Kalvan’s world. Included is a map of the Upper Kingdoms, which covers the Great Lakes Region and part of Canada. A collection of correspondence between Carr and his cover artist, Alan Gutierrez. The letters range in date from 2006-2012, and include several printouts of the covers Gutierrez was working on at the time. A collection of material related to the Paratime Universe of Lord Kalvan of Otherwhen. The material includes typed notes, flyers, articles, and maps. 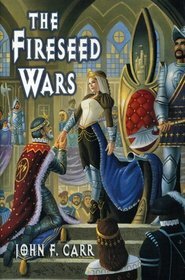 A short story by Jim Landau, titled “The King’s Right Arm.” The story takes place in the Paratime Universe of Lord Kalvan of Otherwhen. A partial typed copy of a story titled “The World Through Rifle Sights,” by Jim Landau. 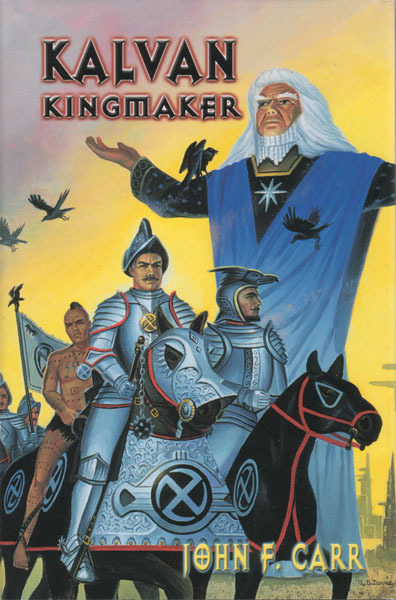 The story takes place in the Paratime Universe of Lord Kalvan of Otherwhen. A collection of photocopied articles about various historical topics. Presumably, these articles were used for researching the Paratime Universe in which Lord Kalvan lives.